Doodle Create an online survey with Doodle – for free! 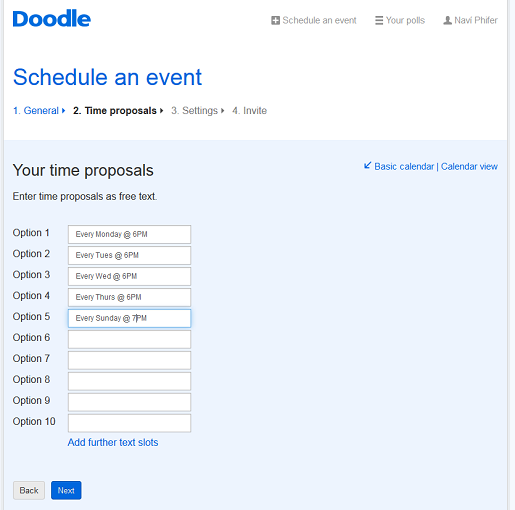 Doodle makes your life easier by allowing you to create online surveys and polls in just a few short steps. This tutorial guide will walk you through this free online survey creator using the example of a Naví, who would like to start a yoga group with his friends. First, Naví logs himself into his Doodle account. Creating a free Doodle account isn’t necessary, but certainly saves you time if you create online surveys often. He then enters the title of his online survey – because he has an account, his name and email address is already filled in. Though it’s optional, Naví can also fill out the location where the group will meet (either an address or vague description such as ‘in the park’ or ‘in a box with a fox’, because no one would want to meet in a house with a mouse, that’s just silly). There’s also a text field for a description of up to 500 characters so that he can add important details to the online survey such as ‘bring your own yoga mat’. Moving on to the next step, Naví has two different options of how to organise the online survey: with dates and times or with less concrete options. For the latter, he can click on ‘Free text’ in the upper right-hand corner to enter such selections as ‘every Wednesday 6PM’. As the screenshot below depicts, he can also click back to the calendar view if he’d rather suggest specific dates and times for his surveys online. Depending on whether Naví enters dates or free text is pretty much the only difference between an online survey and an online poll. Step three is by far the most exciting part of making the online survey. Here Naví can choose whether he wants to limit the number of participants in his yoga group on any given day (a smaller group is usually preferable), and since he has a premium account he can also request additional information from the participants such as phone number. It would be a shame to meet up in the wrong area of the park and not have the mobile numbers of the people in your group! After everyone has completed the online survey, Naví is notified via email and even has the option to export the poll to Excel after logging into the administrative section of Doodle’s surveys online. It’s such an easy and quick way to organise meet-ups or post a survey. So, why not register a free account with Doodle and make your own online survey today?